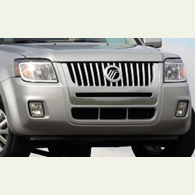 (autoinsidernews) - Ford quietly unveiled the 2008 Mercury Mariner, which is promised to go on sale in early 2007. The second-generation Mariner crossover features an extensively revised exterior and an all-new interior. The sheetmetal changes include a redesigned front fascia, with new headlamps, and a larger waterfall grille; the sides of the Mariner are cleaner with no lower body cladding or rub strips and also feature larger fender flares. Out back, the new Mariner sports a revised tailgate, and new clear taillamps with it red brake lens in the center, reports Trend. The 2008 Mariner is the first product to truly deliver 100 percent of the design DNA for Mercury as a brand says Kim Irwin, Mercury brand manager. It looks good and drives well, it has sophisticated style, and it's not like anything else out there. The 2008 Mariner powertrains are a carry-over with a standard 2.3L four-cylinder producing 153-hp and 152 lb.-ft of torque. The Mariner is available with a 3.0L V6 developing 200-hp and 193 lb.-ft of torque. Both engines come with a standard four-speed-automatic transaxle. Inside, the 2008 Mariner's all-new interior features higher quality materials and sports a new instrument panel, center console, new seats, door trim panels, A- and B-pillar trims, and a new floor-mounted shifter. The instrument panel gets new Ice Blue lighting, and the rest of the interior features satin pewter finishes and chrome accents for a more upscale look.